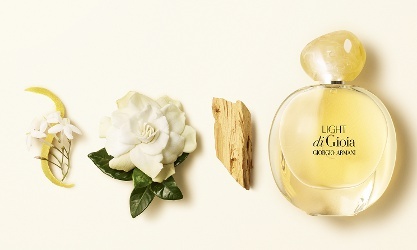 Giorgio Armani has launched Light Di Gioia, a new fragrance for women. Light Di Gioia is a followup to 2010′s Acqua Di Gioia; the last in the series was 2017's Sky Di Gioia. Discover Light di Gioia, the joyful, feminine fragrance from Giorgio Armani. The woody floral fragrance captures the plenitude of the golden hour, when the sun is still radiant, warm and caressing. Experience the sparkling duo of Jasmine & Gardenia facetted by an addictive woody accord. Light di Gioia, the feminine fragrance by Giorgio Armani, is an homage to the golden hour; the moment of the day when the sun goes down and the light, still radiant, becomes soft and warm, leaving beautiful shadows behind. Light di Gioia starts with a bright green zest of Italian bergamot and is followed by a sparkling duo of Jasmine and Gardenia. Addictive notes of a luminous woody accord enhance this radiant joyful fragrance. Giorgio Armani Light Di Gioia is available in 30, 50 and 100 ml Eau de Parfum. Huh. I’ve surprised myself by actually being interested in smelling this. I also find the bottle and the photograph pleasing. The original was so gorgeous and different from anything else! The photograph does it, I think! I got interested too and I never like anything from this series. Fantastic, I will go ahead and forget about it. Thanks!